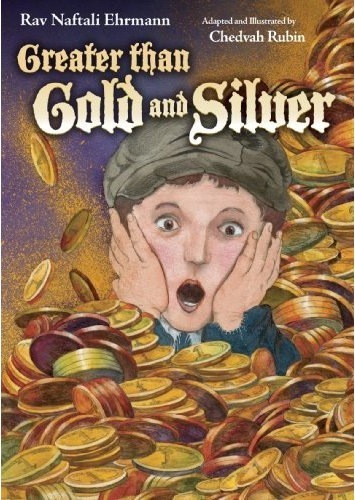 Expert Review of Greater Than Gold and Silver by Naftali Ehrmann, one of our picks of the top Jewish books for kids! Delight your family with this beautiful, and inspiring Jewish tale. The etrog fruit is needed for the celebration of the Jewish holiday of Sukkoth. But in pre-modern Europe, these tropical fruits were rare. What happens when a poor peddler owns the only etrog in town? Will he sell his mitzvah for a vast fortune? A charming, and moving book that children of all ages — and their parents! — will thoroughly enjoy. Goldy Says: "Incredible Book! I read it like a million times! It teaches us how precious Torah and Mitzvos are."